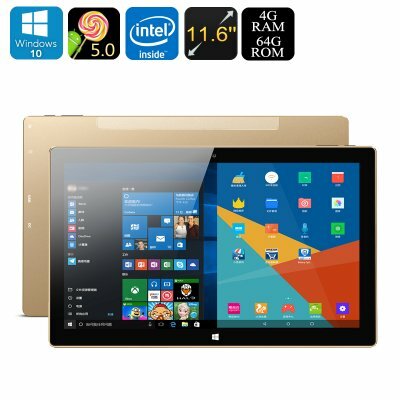 Successfully Added Onda oBook 11 Plus Tablet PC - Windows 10, Android 5.1, Quad-Core CPU, 4GB RAM, 11.6 Inch IPS Display, 1080p, 7500mAh to your Shopping Cart. The Onda oBook 11 Plus is a multifunctional and affordable tablet PC that, thanks to its magnetic interface, can easily be attached to a detachable keyboard (not included) – turning it into a full-blown laptop. Featuring both a Windows 10 and Android 5.1 operating system, this Dual-OS tablet comes packed with the best features of both. As an Android tablet, it brings along countless of entertainment possibilities through its mobile applications and games. When used with its Windows operating system, this Windows tablet PC lets you take full advantage out of all the trusted office tools – allowing you to write up documents and create presentations for work or school. Perfect for entertainment, business, and study alike – this affordable tablet computer is sure to meet all your demands. Featuring top-notch specifications, the Onda oBook 11 Plus is a relatively cheap tablet PC compared to similar models on the market. Packing the Intel Atom Z8300 64-Bit Quad-Core CPU, along with 4GB RAM, it is capable of handling the latest Android applications, Full-HD movies, and demanding games. Additionally, it will run all your trusted Windows programs effortlessly without slowing down your device. Coming with a powerful 7500mAh battery, this Dual-OS tablet computer allows you to enjoy all the features it has to offer for up to 6 hours in a row – enough to get through a day at the office or university without needing to worry about running out of juice. On its absolutely stunning 11.6 Inch display, this two in one Windows and Android tablet PC lets you enjoy all media and programs in stunning beauty. With its 1080p resolution and latest IPS technology, it treats you with vivid color and high-detail – truly letting you take the most out of your upcoming mobile entertainment experience. With 64GB of internal storage and 128GB of external memory support, you can be assured that there always will be some space left available for you to save your latest downloads. Carry along all your documents and countless hours of media and entertainment on one device – from now on you’ll never have to be bored again. At the front of the Onda oBook 11 Plus, you will find a sophisticated 2MP camera that lets you engage in HD video calls at any time of the day. From now on all your friends and family are nothing but a Skype call away from you, assuring that you’ll never have to miss them again even whilst located at the other side of the globe. By allowing you to connect external hardware devices to your tablet PC thanks to its OTG support, this Android and Windows tablet PC further enhances your overall user experience. Additionally, it also lets you connect your tablet computer to your big screen TV via its micro HDMI output, allowing you to browse the web and enjoy all its features on your own television. The Onda oBook 11 Plus comes with a 12 months warranty, brought to you by the leader in electronic devices as well as wholesale electronic gadgets..
Arabic: - 11 بوصة الكمبيوتر اللوحي - Chinese Simplified: - 11 英寸平板电脑 - Czech: - 11 palcový Tablet PC - Danish: - 11 tommer Tablet PC - Dutch: - 11 inch Tablet PC - French: - 11 pouces Tablet PC - German: - 11-Zoll-Tablet PC - Hebrew: - מחשב לוח 11 אינץ - Hindi: - 11 इंच गोली पीसी - Italian: - 11 pollici Tablet PC - Japanese: - 11 インチのタブレットの PC - Korean: - 11 인치 태블릿 PC - Malay: - 11 inci Tablet PC - Norwegian Bokmål: - 11 tommers Tablet PC - Romanian: - 11 inch Tablet PC - Russian: - 11 дюймовый планшетный ПК - Spanish: - 11 pulgadas de Tablet PC - Thai: - 11 นิ้วแท็บเล็ตพีซี - Turkish: - 11 inç Tablet PC - Vietnamese: - 11 inch Tablet PC.